Rock Band for RPG of the Year? Journalist Stephen Totilo is wondering what the term "role-playing" really means to the game industry and what games deserve the broad label. 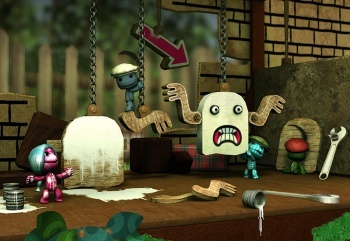 Titles like Spore and LittleBigPlanet allow players to morph into God-like designers of the universe. Music sensations Rock Band and Guitar Hero offer a rock star experience in the living room. Writing at the MTV Multiplayer blog, Totilo believes that these are better examples of what the term "role-playing game" should mean to gamers than traditional RPGs such as Final Fantasy where you're not "playing a role." Totilo stated about the old explanation of the acronym, "What did anyone ever mean by the term 'Role Playing Game'? Such games were the ones that made you someone else, that told a story, that, possibly, sprang from Dungeons and Dragons. They weren't action games. They weren't racing games. They weren't flight simulators. An RPG's lead character would usually have to exhibit some growth, calculated by and expressed with statistics. Fallout was an RPG. Zelda 2 was. So would be Fable and Final Fantasy." He feels a better definition is that "to role-play is to become someone else. To role-play effectively is to buy one's own act and have those around you buy it too." "They're playing the role. They're living the fantasy," said Totilo of those who try out the four games he listed as the new-age RPGs. "Compare that to the experience presented by the the games I used to call role-playing games, the Fallout, Fable or Final Fantasy games. Those now seem merely like enjoyable scripts I can orchestrate at a puppetry playhouse. They don't turn me into someone else with the effectiveness of Spore or Rock Band." "The old role-playing games were defined by what I could do and, in theory, who I could be," he concluded. "Many of them are among the greatest games ever made and they exist in a genre that will hopefully continues to flourish. But their genre name suits a different group of games better, I think." Game journalists are so bored. It's just what that genre of games has become known as due to the fact they're based off of the concept of pen and paper RPG's, where people really would play a role. What else are we going to call games like that. I love how as examples of games that aren't as much role-playing games, he uses Fallout and Fable. That makes me laugh. I get where he's going with this but I'm with Klutz...changing the meaning of an internationally accepted and social affirmed term becomes vaguely pointless after a point. Not to bust out the big words like Wittgenstein, but the entire meaning of "role-play" comes from the context of gamer culture, not the actual game itself. In my own followup article, I'm going to argue that "space sim" is inaccurate in referring to games that occur in outer space, and instead should refer to any game that simulates activity in a physical space. Then I shall declare that The Sims was the greatest space sim ever created. As my closing argument, I shall redefine what "Metal" means for musical genres, and award top honors to steel drum ensembles. I was going to comment but I think Virgil has pretty much closed the book on this one. I suppose he's got a point, but it's all for nought really. Nobody worries about how, for example, the music genre 'rhythm & blues' got redefined - it used to be stuff like Cream, The Yardbirds, etc but now it's been shortened to R&B and roughly equates to "girls who think they're Diana Ross and boys who think they're Lionel Richie". So yeah, it's probably reasonable... if Rock Band lets you play the role of a rock star, I guess it's more of a role-playing game than the Final Fantasy deal where you're basically just wheeling a few people around the screen and reading what they've got to say. But, is it likely to catch on? Well, no, of course it isn't.